The Mission Study Team continues leading our congregation’s self-study and its learning about our community. We are now moving toward the culminating Mission Study Report that will be submitted first to our Session, and then to Presbytery’s Commission on Ministry for approval. The Mission Study Report will be informed by the six key activities of our mission study: Congregational Gatherings, Congregational Survey, Historical Review, Financial Review, Demographic Study, and Community Study. We continue listening together for God’s leading for this church. Although the MST members are writing, we still encourage you to share your comments, questions, and suggestions via our online suggestion box, email, or conversation with any team member. We believe that your contributions are central to the value of our Mission Study Report, and we sincerely hope you will share your thoughts and opinions! Thank you for your participation, prayers, and support! Note – sections with recently updated information are noted in bold and with an asterisk (*). The last updates were made on April 19, 2018. In the life of any organization, change is certain. UPC is no different. We travel this interim season together in hope, holding fast to the one who always holds fast to us. We do so in confidence, acknowledging and embracing the words of Paul in Philippians 2:12, “It is God who is at work in you, enabling you both to will and to work for his good pleasure.” As the University Church family, we seek to open our hearts to God’s love, to open our minds to God’s will, and to transform our prayers into deeds that forever glorify God. During these next few months, our church will engage in the process of “mission study,” which is aimed at discerning God’s voice and leading for our church. Although the process is unfamiliar to many of us, the larger church offers important guidance in helping churches thrive during pastoral transitions. Both Presbyterian polity and wise practice endorse such a mission study, especially after a church loses the leadership of a long-serving and much-loved pastor. Our mission study will help us to consider our identity and mission as we move forward as a church, thereby enabling us to reach a deep, honest, and mutual sense of call with a new head of staff when the time is right. To lead us during our mission study, Session has ap­pointed a team of members to support the congregation. This Mission Study Team is charged to engage with the congregation and the larger community to discern God’s voice and leading for our church. Together with the congregation, the team will carefully and prayerfully listen for who we are – and who God is calling us to be. You can find the team members’ names and contact information below. One of the MST’s most visible products will be a Mission Study Report, which it hopes to produce later this spring. The report is submitted for consideration and approval by both our Session as well as the Commission on Ministry of the Presbytery of New Hope. Only after the Mission Study Report is approved by Presbytery will the search for our new pastor officially commence with the election of a Pastor Nominating Committee, or PNC. Our Mission Study Team has already met several times to develop a process for the mission study, and our timeline was designed so that our PNC can begin its work as early as June. The MST asks that you anticipate engaging in our mission study by participating in small-group meetings and larger town hall gatherings, as well as in a forthcoming congregational survey. Your participation is needed and you can read more below. You will see specific invitations to participate highlighted for you in the weekly Bulletin Insert and E-news, on this webpage, and even in our building. Although your MST is charged with creating the final report, its content and style will be driven and shaped by contributions from all of you who lend your voices, opinions, suggestions, and concerns. Some of the key steps in completing UPC’s Mission Study are noted below. The Mission Study Team forms, is commissioned, and begins regular meetings to follow the process outlined in the Presbytery’s A Guide for Churches Entering into an Interim Time. Part 2: Conducting a Congregational Mission Study. Determine goals, key stakeholders, and potential report contents for each Key Activity. Design processes and identify team leaders for each Key Activity. Utilize relevant resources including books, other church Mission Studies, websites, church experts, etc. Congregational Gatherings. We thank each of you for your engagement in the Congregational Conversations. Eleven conversations, each lasting 45 to 90 minutes, engaged around 200 of our members, including both youth and adults, in face-to-face conversation. Participants graciously gave of their time to provide well-considered input into describing UPC’s identity and calling. The MST gleaned rich insights into how you see UPC as it is and how you envision this church at its best. Moreover, all participants at our worship services on Sunday, April 8, were invited to respond more personally to Margaret’s “tattoo” questions: What’s the word or words that you need to see in the mirror to remember who and whose you are? What word has God written on your heart that needs to be shared with the world, as a public statement? Our gatherings will conclude with Congregational Town Hall Meetings during which the MST will present select preliminary findings and participants will be able to provide responses to extend our understanding of key challenges and opportunities for UPC. 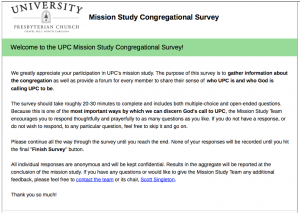 Congregational Survey. In a complementary way, the Congregational Survey captured both demographic data and thoughtful responses to open-ended questions that deepen our understanding of who we are and where we hear God calling us to act and serve. We received nearly 300 survey submissions from UPC participants. Historical Review. The MST has delved deep into the history of UPC, which shares it origins with the university across the street. The decisive stories of our congregation’s history are important as we consider our historical identity to be the roots for our church’s future. A shared knowledge of our history will inform us about both those aspects of our identity that we continue to value, as well as how we must evolve to best follow God’s leading for our church into the future. Financial Review. Similarly, the MST has studied UPC’s financial and stewardship data, with a focus on the past five years. Our financial situation is stable, and our members are very cheerful givers who do so with abundance. Historically, our congregation has shown an openness to faithful risk-taking for missional needs outside our walls. Demographic Study. Part of the process of understanding who we are and what work God has planned for us in this time and place is getting to know ourselves and our relationship to the community to which we minister. The MST has collected demographic data from PC(USA) Research Services, from our Congregational Survey, and the Town of Chapel Hill’s Office for Housing & Community. These data describe aspects of who we and our neighbors are now, and who we and they probably will be in the coming years. This can provide valuable information about the needs of our community as well as how we might reach out to potential new members. Community Study. Two members of the MST have interviewed over 20 community leaders to learn more about key needs in our community, the role of organizations of faith, and how our neighbors view us. The MST will summarize the responses of community leaders to key questions in an effort to discern where and how our passions can be directed to serve our neighbors. Review and analyze all information from conversations and survey data. Summarize findings that apply to our history, as well as current and future direction. Write analysis sections. Prayerfully reflect and consider the findings from the stakeholder engagements and gathered data. Complete the Mission Study Report, including drafts, reviews, and edits. Determine the report format and communication plan for Session and the Presbytery, as well as the congregation. Present report to Session for adoption. Upon adoption, submit Mission Study Report to the Presbytery Commission on Ministry for review. Presbytery can request more information. Upon Presbytery approval, Session thanks and dismisses the Mission Study Team. The Mission Study Report is now ready to be used by the Pastor Nominating Committee to call our next senior pastor. Who is on the Mission Study Team? Mac Gilliland, Nancy Jones, Carolyn Karpinos, Vicki Lotz, Madi Marvin, Gordon Merklein, Thad Monroe, Katie Sanford, Lee Scott, Scott Singleton (chair), and Margaret LaMotte Torrence (staff). You are welcome to contact any individual on the team, or send a single email to the entire team. How were they chosen and asked to serve? Session appointed these members to serve in this capacity at the recommendation of UPC staff. This Mission Study Team (MST) is charged to engage with the congregation and the larger community to discern God’s voice and leading for our church. Together the MST and congregation will carefully and prayerfully consider of who we are, and who God is calling us to be. The MST will submit a Mission Study Report, first to UPC’s Session and then to New Hope Presbytery’s Commission on Ministry. Prior to the completion of the report, the congregation will be provided an opportunity to respond to preliminary findings in April. Meetings have been held on the following dates at this point. Through May, the MST will meet weekly on Tuesdays from 7:00 to 9:00 pm. The team gratefully welcomes your comments, questions, and suggestions via this webpage, email (missionstudyteam@upcch.org), or conversation with any team member. The team knows that your contributions are central to the value of the Mission Study Report, and they hope you will share your thoughts and opinions! Through our Congregational Conversations, and Historical, Financial, Demographic, and Community Studies, the MST is learning much about this congregation and our community! We are also grateful for the 295 responses to our Congregational Survey. These responses, combined with the notes from the small-group Congregational Conversations, will serve as the foundation to the Mission Study Report, which is the culminating product of the mission study process. Before our writing begins in earnest, we want to share learnings with you, and to give you a chance to respond. We invite you to join us for a Congregational Gathering. Please attend one of the two town hall meetings Sunday, April 22, in Fellowship Hall (9:45 and 12:10) as we share some of our preliminary findings and invite discussion about how they reflect God’s call to UPC. The two meetings will be essentially identical, with one occurring between services and the second after the 11:00 service to accommodate a variety of schedules. The nursery will remain open, and snacks will be available both for participants and for children in the nursery. Please plan to join us for one of these meetings! Our mission study process will require the participation of everyone in the congregation. 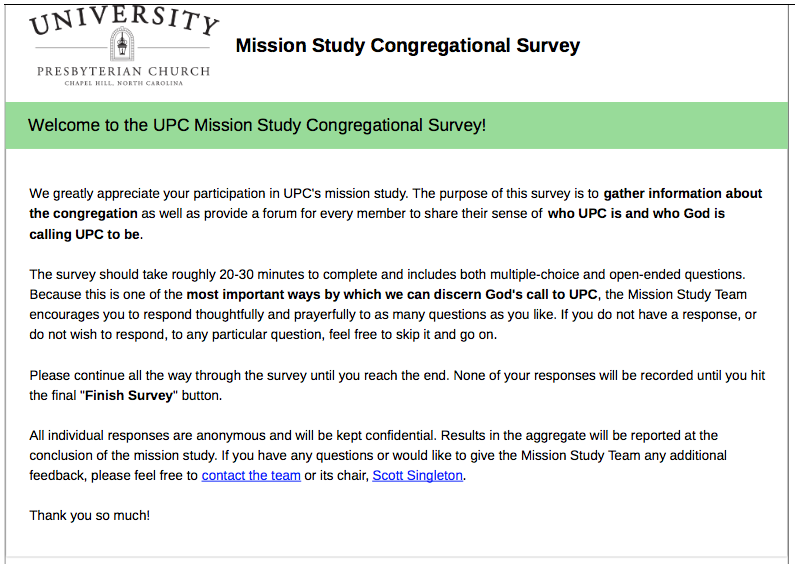 The survey provides every participant at UPC a tangible way to engage in the mission study process by providing direct input on UPC’s identity and calling. The survey also allows us to gather information that supplements the demographic data collected automatically by PC(USA) as part of UPC’s reporting. Your individual responses will be anonymous, while results in the aggregate will be reported at the conclusion of the mission study. We believe that the congregation’s answers will supply important information to us and to our new pastor. Please complete the survey before 11:45 PM on Sunday, April 15. If you would like a printed copy of the survey to fill out by hand, please let us know by contacting Ginny Horne in the church office. What can I expect in the survey? The survey should take roughly 20-30 minutes to complete, and includes both multiple-choice and open-ended questions. Because the survey is one of the most important ways by which we can discern God’s call to UPC, the Mission Study Team encourages you to respond thoughtfully and prayerfully to as many questions as you feel comfortable answering. If you do not have a response, or do not wish to respond, to any particular question, you are welcome to leave it blank and move on to other questions. To facilitate your thoughtful and prayerful consideration of the survey questions prior to completing the survey online, we have provided a PDF version of the survey below. However, please note that we prefer that you use the online survey form to submit your responses. When will small-group conversations occur? The team is seeking to include everyone’s voice in the process! Any member of the UPC family should plan to attend any ONE of the above gatherings in Dunham Hall. Additional conversations with standing groups of the church are currently being scheduled, including: Presbyterian Youth Connection, the Deacons, Carol Woods and Carolina Meadows residents, Presbyterian Campus Ministry, and Young Adults. If you regularly participate with one of these groups, you do not need to join a conversation during the Sunday School hour. Why do you participate in the life of University Presbyterian Church? What do you think God is calling UPC to do and be? How can we strengthen the congregation to respond to God’s call? Our Mission Study Team has designed this process to engage you in helping to discern God’s voice and leading for our church. Our process will involve careful and prayerful consideration of who we are and who God is calling us to be, as well as the identification of our collective experiences, gifts, passions, perspectives, and the strengths and needs of our community. Come join us as we set off down this path together! Our mission study process will require the participation of everyone in the congregation. The Mission Study Team members will keep the congregation informed about ways to participate, but if you are interested in participating, please contact the team via email (missionstudyteam@upcch.org) or by speaking with any team member! In addition to the meetings noted above, the team is also planning for a congregational survey as well as a some large-group events. These events would welcome every member of the congregation, and may be held as part of both worship services on April 8 as well as two other events after each worship service on April 22. The team will post more information here as soon as plans are finalized. Watch for more opportunities to engage in this process over the coming weeks!